This 6 Foot Mission Park bench without back is made of 3" x 4" recycled plastic lumber and heavy duty powder coated frames with stainless steel fasteners. 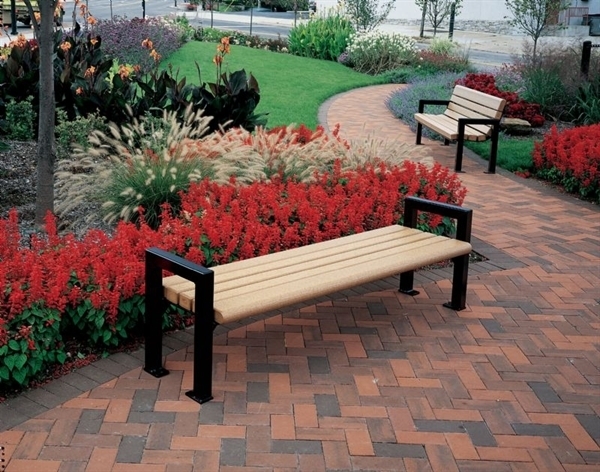 Mission Park Bench offers the ultimate in contemporary design and the needed ruggedness for bustling high activity areas. Black frame with cedar color slats (as shown) only. Ships fully assembled. Recycled Plastic Bench with Back 6 Foot, with Powder Coated Steel, Surface Mount, 362 lbs. Rectangular 6 Ft. Recycled Plastic Picnic Table, Portable, 578 lbs.